tips and tricks how to do so! a hair dryer wich can blow cold - warm - very warm heated air. Train the puppy to lying on his back and/or sideways and being groomed when he is young. The best time to train the is at the early age of 6 weekd at the breeders home, the earlier the puppy is use to being groomed the better. It is important that "you" the client, also start grooming as a play , on your lap, and on the furniture or grooming table. Always be carefull that the puppie don't fall on the ground. A young Lhasa Apso puppy does not require a lot of grooming, he need to understand it before his coat starts getting mats and tangles. Always be friendly to the puppy, dogs accept better teaching with a friendly way of theaching obedience! Brush your Lhasa Apso coat in layers. Lay the dog on his back or side, "do this with the use of your arms around the body so he feels safe" push the coat the wrong " reverse" way and, starting with the undercoat, brush down one layer at a time as you work your way to the top. Use an anti-static spray, a detangler, or some creme rinse mixed with water and lightly mist each layer before you brush it. You will notice that the grooming goes more smooth then grooming a dry coat, it also protect breaking hair. Begin with the Tail, move to the insides of the back legs, the insides of the front legs, then the outsides of the legs, working your way to the top. Turn the dog over and repeat the process on the other side. Don't forget the chest, neck, ears (and behind the ears). Finish with the top of the head and face. It is properly speaking unnecessary to say that mats are forbidden for a Lhasa Apso! Removing mats is a job you have to do very carefull, spray the mat lightly to lubricate the hair. If the mat is large and packed solid, you may have to spray it with a coat conditioning oil, or use a creme until it started to saturate. Do not forget that dematting can be painfull for the dog! Your Lhasa Apso will try to quit the job. Pull the mat apart as much as possible with your fingers, then use the end tooth of the comb to loosen the individual hairs. Alternate between separating the mat with your fingers and separating it with the end tooth of your comb. Never try to pull the entire mat out at once with the comb or brush. It HURTS! And your Lhasa will let you know he doesn't appreciate what you're doing to him. 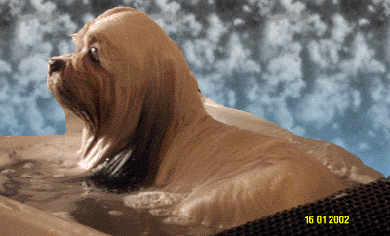 Mats seperate sometimes in during bathing with a lot of greasy creme-rinse, but it will always damage the coat. To avoid mats in your Lhasa Apso coat, brush him at least weekly, and twice a week if needed. Brushing the Lhasa's coat before bathing to removing mats and/or tangles might get worse when they are wet. 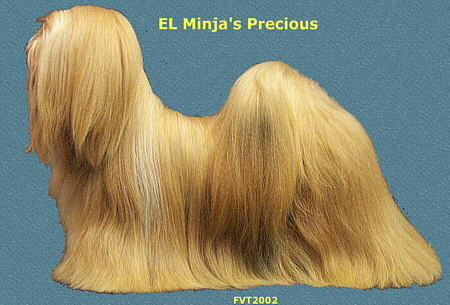 There are different techniques to bathing the Lhasa Apso wich are easy and does not cause the coat to tangle. First you wet the Lhasa Apso's coat completely, then create a blend of shampoo and water ( 2 spoons shampoo on1 pint of warm water, shampoo composition is depending on the product,see remarks on the product) let the blend flows over and in the coat in a downward motion. Do not massage it into the coat in a circular motion as you might do when you wash your own hair.Secondly spray with water all the shampoo out of the coat and be sure it's well done. When the bathing is finished, squeeze all the excess water from the ears, legs, and tail before removing the dog from the tub. Use a towel for the first drying your Lhasa Apso's coat and squeeze the coat with the towel to remove as much moisture as possible. Don't rub the coat with the towel to prevent making tangles or mats. 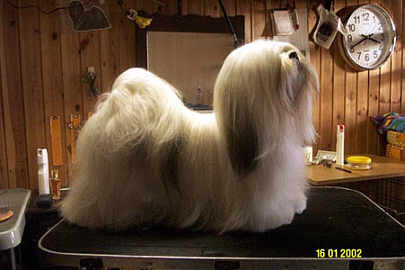 Finally, dry your Lhasa with a blow dryer. Set the dryer at a comfortable temperature ( handwarm) and speed, lay the dog on his side while you brush and dryblow his coat in layers. Be sure to completely dry the insides of the legs and behind the ears. Most Lhasa Apso owners have problems with the hairfall over the eyes, indeed it can be a problem as you don't know how to handle with the top knots or barrets as they also been called. Take a good look at the above picture. 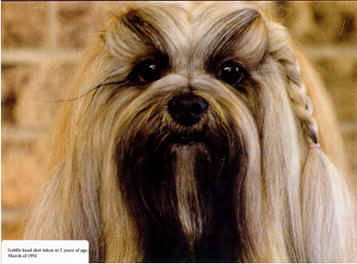 You have to experiment and you will come up with a suitable hairstyle for your Lhasa Apso. Some suggestions for keeping the hairfall pulled back. Barrettes and Latexbands are the weraing tools for keeping the hairfall behind the eyes, myself I do use Latexbands, simple because my other dogs like to chew on the barrettes or make it a game for chasing the ones who bear barrettes.....! You can brush the hairfall back in two parts in the middle of your Lhasa Apso's head , take a hairfall till the end of the head ( occupit) horizontal from the eye , above the ear to the occupit and secure a barrette in either side so you have two hairfalls both side. For this you can ofcoarse also use strong Latex bands. You also can braiding your Lhasa Apso's hairfall, see the picture, the way to do so is not easy , but with experiment and patience it can be done. Very important is the care for the feet and specially the hair between the pads! Use a proper but cheap scissor to cut the hair between the pads and be very carefull do not cut in the pads themselfs! Check the nails length and cut them shorter if they are too long, good lenght is groundlevel with the pads bottom, if you cut them to short the nail will bleeding there is a special powder to stop nail bleeding. Check first and if you have any doubts ask the Veterinarian to do it for you. Always check the feet for mats and try to keep them clean. Clean the feet wenn you arrived home after a trip in the woods. Also clean the feet after you have been out with your Lhasa Apso in winter time, it is possible ice and road solutions is frozen between the pads. Very important is the care of the Ears and specially the hair in the ears! Be sure that the ears are clean, the ear skin isn't red and the ears area's are free of parasites. Do check if there is not to many hair in the ears, use an earpowder to remove the hairs, follow the directions on the bottle. EL Minja's Rani finished her grooming session! IF YOU HAVE HEALTH QUESTIONS OR DOUBTS ALWAYS CHECK WITH YOUR VET!